TrustFord’s commitment to reducing their environmental impact, year on year, has been recognised by The Green Organisation for the fourth consecutive year; winning the annual Green Apple Award for Environmental Best Practice. 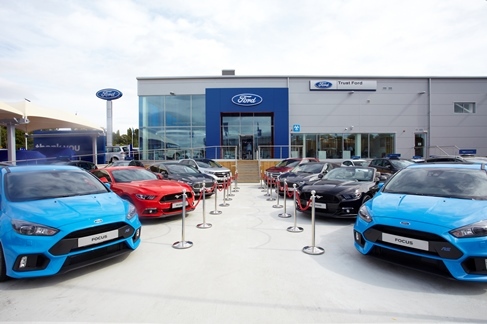 The world’s largest Ford dedicated dealership group is now eligible to become a Green World Ambassador, representing the company and the UK in the Green World Awards 2018. The Green Apple Environment Awards were launched in 1994 by The Green Organisation and have become established as one of the most popular global environmental campaigns. The awards celebrate organisations that have made a positive impact on the environment and are working to improve sustainability. As part of the company’s drive and commitment to being a Good Corporate Citizen, Energy Management was rolled out across all 58 dealership sites, with the simple aim of reducing the carbon footprint of the business. This aim has been achieved with current energy savings at 20% across the business. For a carbon reduction programme to be a success, it is vital for all levels of the business to drive forward behaviour and cultural change, without impacting on core business operations. Support from management within TrustFord ensured a rapid and smooth rollout across all sites, with Energy Management Workshops, hosted by Purchase Direct, engaging and educating sites early on. Working alongside TrustFord, analysis of energy data from each site was carried out by us to create bespoke energy reports for each dealership. This meant that energy patterns could now be monitored daily, with waste identified and tackled immediately. Data analysis is also used to validate and justify investment in energy saving technologies, such as LED lighting and Photo Voltaic installations; to provide maximum carbon savings with the shortest ROI possible. This approach has resulted in significant reductions in carbon emissions over the period since the programme launched and provided an essential component to achieving the Green Apple Award for four years running. Alongside the metering and monitoring, we conducted detailed Energy Audits of the 58 locations across the UK and Northern Ireland, to focus attention on key areas where energy consumption could be managed more effectively. Following the audits and energy management workshops, we provide ongoing support to the Energy Champions in place working hard to drive down energy consumption where possible. We continue to offer advice and guidance to ensure the focus is maintained and savings are maximised.